Tables like yours have an almost magical quality to them. You can feel the history while you rev up your creative energy. You have a lovely space to work. You have eked out a very nice space for yourself in a clever way. Your guests would never guess that a crafting corner existed there. Lovely lights! You have beautiful organization! Blessings dear. Great space! love the use of curtains! LOve your very sweet and compact area! What a great way to make a space for your creative muse. Perfect area to do what you love to do. And spreading out to the dinning area is a good use of that space too. I'm pretty sure we spend more creating than we spend eating. Sound like you have made it work for you. Thanks for sharing your crafting space. This blog party has been so much fun today, but I'm not getting anything else done! Those hydrangeas on your banner are to die for. A perfect little space. And is that a featherweight I see? I'm jealous! I also love zinc topped tables. Thanks for sharing your space! Oh it is such a neat space. I especially love your creatively covering the bookcases. 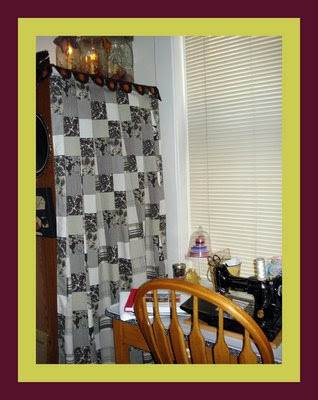 I am really thinking of doing that in my sewing room. Thanks for sharing your great space. you win the prize. 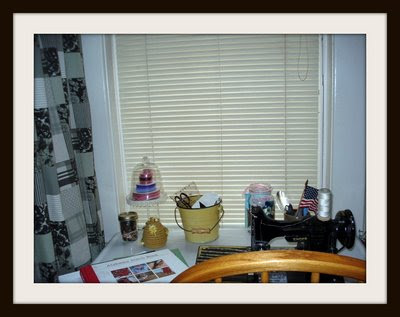 Absolutely love the curtain, the desk, and the old black sewing machine. Is it a singer? It is perfect...and you have a window. Bonus! I work on a table that belonged to my grandmother and it's as sturdy now as it was when she had it. Blessings to you this very day! 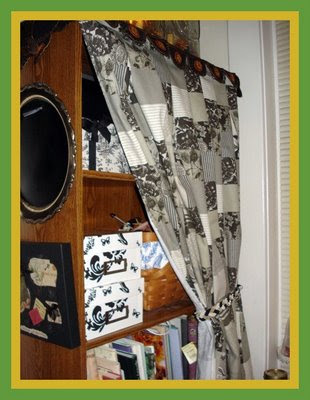 Great idea to use a curtain, to hide your stuff! Thanks for inspiration, have a nice day! You have created a nice little spot for yourself! Although I have a room for my creativity, I use my DR table quite a bit. The light is so much better in there. I tend to create all over the house. Thanks for letting me visit! I am lovin' this party!!!! It's wonderful little space. Thar curtain is just perfect. Black and white is one of my favorites! Thank you so much for coming to my party. You've really helped make it a success! The curtains over the bookcase is a clever idea! Your sewing machine is fantastic! What a beautifully creative space you live in! It is a pleasure to make your acquaintance at this lovely event; please do stop by for a visit soon! Beautiful little machine in a beautiful little area! Thanks for sharing with us! What a sweet little space. Love the table! The curtain idea is great too. Thanks for sharing. Personally I would love to be a guest for dinner in a crafting room. There is always something fun to look at! Thanks for the peek into your world! I think it's so important to make a space for yourself! I love that curtain and what a good idea to have it hide the things on the bookcase! Great idea with the curtains! it doesn't matter where you create, just as long as you do! It is not the size of the space, but how it is used...that's my motto (and you use your space is such a creative way)! I love your zinc-topped table - one of my favorite things! Also love your blog header - hydrangeas are some of the most beautiful flowers, especially in purples and blues. Thank you so much for sharing your space!